Panorama classique de Santorin: Visitez les destinations les plus populaires de Santorin! 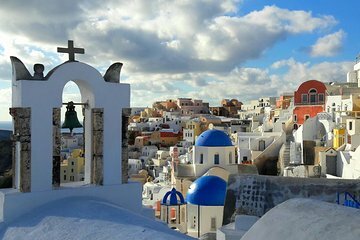 Explorez les sites les plus emblématiques de Santorin lors de ce voyage privé de 6 heures. 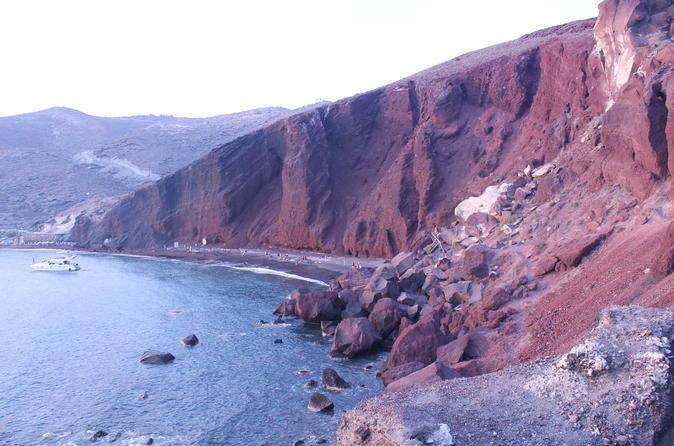 Visitez le plus haut sommet de l’île, les plages rouge et noire, les petits villages et fermes familiales, le phare d’Akrotiri et le célèbre village d’Oia. Pour le départ de l'après-midi, passez la journée à s'imprégner de l'atmosphère de l'île, à déguster du vin local et des produits fabriqués à la main, et à admirer la vue sur la mer Égée avant de terminer la visite avec un magnifique coucher de soleil dans le village d'Oia. This was the highlight of our Mediterranean Cruise trip. Michael did a great job! The limo was immaculately clean and very comfortable. He was very nice and personable. He took us to all the great places and patiently answered all of our questions. He took pictures of our group for us and gave us options for what we wanted to see. Fantastic! Our tour guide is Kostas who is very friendly and knowledgeable. He took us to some of the most amazing spots for pics. We saw everything that we planned to see. Definitely recommend Kostas and this tour. ABSOLUTELY INCREDIBLE! Our guide Kostas was friendly, personable and very informative. He took us to some of the most amazing spots and each time he would say now you're going to see something even more beautiful...and he was right! He took us to the cutest little village with shops and an incredible view, and the Black and Red beach. The panoramic views were breath taking. He knew I loved taking pictures so he made sure I got some awesome shots and he also took several great pictures of me and my husband. We highly recommend this tour and our guide Kostas! Ok, so I cant say enough positive things about our day in Santorini. We were a bit stressed meeting our guide on time due to the delay in the boat from our cruise and despite being an hour later that when we told our guide we would be there, we showed up and he was still there holding a sign with my name on it. The van was spacious and comfortable. Kostas was so friendly and personable- he truly seems to love people and love what he does. We were traveling with 4 adults and an almost 2 year old so he tailored the day to things that would be interesting to us all. He made sure we hit up the not to miss spots and also took us to some places that were more private and less touristy and great for our son to run around and play. My son was not feeling great so he even helped us find a pharmacy so we could get him medication. He spent the whole day with us- sharing bits of information about the island, geography, culture, etc while we were driving and had a flexible, go-with-the-flow attitude. He took us to some of the best places to get photos with a Santorini panorama in the background. Overall, I would say we got so lucky with Kostas and this tour. It was the best way I could imagine to spend the day on the island. Would definitely highly recommend. We had a great time during our island tour of Santorini. Cristos was waiting for us at the cable car exit and we were quickly on our way around the island. He was very enthusiastic and accommodating, and made sure that we saw everything on our list plus a couple of places that we had not thought of. The vehicle was new and very clean and comfortable. The highlights included getting to Oia before the cruise ship crowds and having lunch at a casual and breezy restaurant on the black sand beach. It was a very easy and fun day, and I highly recommend Costas and the Classic Santorini Panorama private tour. This tour is a great way to see the island of Santorini highlights. Lunch and swim at Black Sand Beach were a great treat. We really enjoyed learning about the history of the island and how it came to be. I have been using viator for all my tours within the past two years and I have not booked a bad one. Definitely recommend this tour. We loved seeing the beautiful churches and blue roofs as you see in photos. We were very surprised by the 3 cruise ships, maybe more that were there the same day we were. It was so crowded that it tookaway form the beautiful scenery. We also had to walk down the slippery, donkey dodo, stairs because the cable car line was about 2 hours long. As far as I understand from past visitors this has been the case for many years and no one is making any changes. Celebrity just deals with it! EXCELLENT SERVICE! Michael from Santorini Road Trips was our guide and we couldn't be more happy with our private tour at beautiful Santorini. I called the number in my booking and Michael gave clear instructions on taking cable cars at cruise ship terminal. Our group of 8 with 3 young kids was greeted by Michael, his new Mercedes van with air conditioning and cold bottled water. He accommodated our schedule and requests and we toured Oia village where the signature Santorini postcard pictures were taken. Then we headed to a beach side restaurant for fresh seafood and we love the Tomato balls that Michael recommended. We also visited the family owned winery with a lovely donkey and the Prophet Elias Monastery and learned about the history and island culture. Michael is an awesome and polite guide and we couldn't be happier with the private tour. ABSOLUTELY OUTSTANDING! Most of us in the 6 person group have cruised around the world taking excursions -- this is one of the best any of us could remember. Anything we asked or wanted, Costas made it happen. He took us to the touristy spots we needed to see, but more importantly got us out of the crowds to the quieter jewels of the island. Saw an amazing winery with outstanding sample foods, met the donkey marco polo who does like selfies, walked up to see the red and black beaches, and took in the local food and spirits on the way back to the ship. We all have been raving about Costas and wish we could have spent much more time with him. Highly recommend this tour for the price and for the experience!! !